A Historian Writes a History of a Tobacco Company and Never Mentions Lung Cancer? Daniel J. Robinson is a historian and associate professor in the media studies program at the University of Western Ontario. 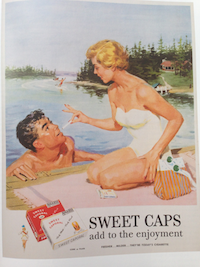 He is writing a book on twentieth-century cigarette marketing in Canada for McGill-Queen’s University Press. After we received the following article by Daniel Robinson, we asked Joanne Burgess if she would like to post a reply. She agreed and submitted the piece that appears below Robinson's article. Below her piece is Robinson's response. 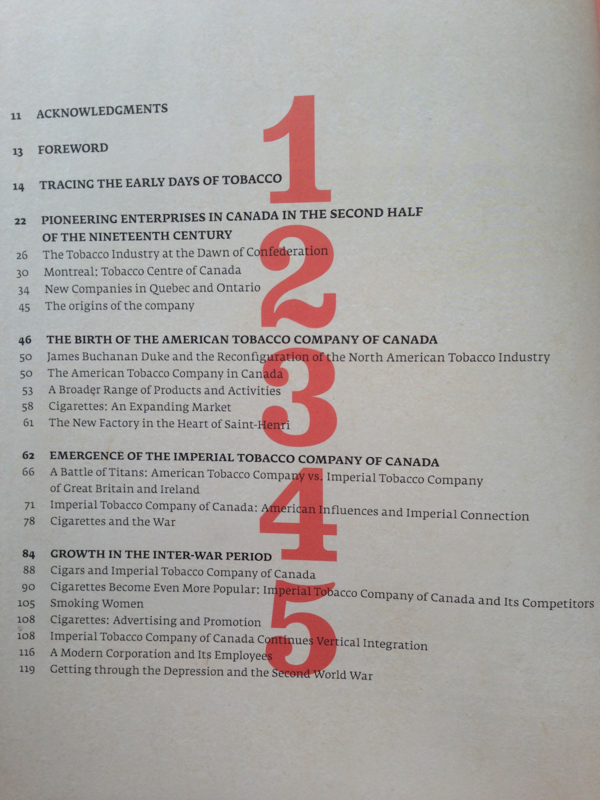 Would it surprise you to learn that a university historian published a book on Canada's largest tobacco firm that never once mentioned lung cancer? What if that same professor then got a $2.3 million research grant from the Canadian government, the same one that spends millions annually on tobacco control? The truth, here, is stranger than fiction. Marc H. Choko and Joanne Burgess are professors at the Université du Québec a Montréal (UQAM). Choko teaches in the School of Design and Burgess in the Department of History. 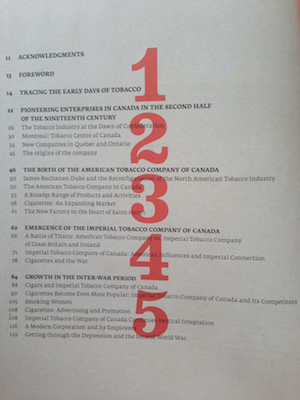 In 2008, they co-wrote the 288-page book, "Imperial Tobacco Canada 1908-2008: Passion and Innovation," commissioned and published by Imperial Tobacco Canada (ITC). The sanitized nature of this account is startling, even by the standards of commissioned history. There is no discussion of tobacco's well-documented health consequences. For example, the rise of filtered cigarettes in the 1950s is described without mention of its primary cause: health reports linking cigarettes to lung cancer and the industry's move to market filtered brands as "safer" choices for anxious smokers. Similarly, their account of the rise of "low-tar" and "light" brands in the 1970s omits mention of the renewed health concerns that helped spawn these product categories. Government regulation of tobacco? Barely a word. A reader of this book would not know that a serious health issue or a public policy controversy even existed with cigarettes. This version of history may well suit Imperial Tobacco. It is embroiled in multiple lawsuits in which its past marketing figures prominently. But the misrepresentation of the historical record here --from a PhD-trained, university-employed historian, in the case of Burgess -- constitutes a serious lapse of professional standards and a violation of the public trust placed in the university professoriate. Imagine my surprise when I recently learned that Ottawa's Social Sciences and Humanities Research Council (SSHRC) had awarded Professor Burgess a $2.3 million, six-year Partnership Research Grant in 2012 to conduct historical research on Montreal as a hub of trade and commerce. (The tobacco industry was a key player in the Montreal economy in the early 1900s.) Two of the grant's institutional partners are Parks Canada, a federal agency, and the Old Port of Montreal, a subsidiary of a federal crown corporation. How does one transition from being a commissioned historian for Imperial Tobacco to the recipient of a prestigious, peer-reviewed federal grant? Did Professor Burgess disclose her research collaboration with ITC and her subsequent book when applying for the SSHRC grant? As reported recently in the press, tobacco firms have hired historians at four Canadian universities (University of Northern British Columbia, Acadia, Laval, UQAM) to conduct research and provide expert witness testimony for an ongoing class-action tobacco lawsuit in Montreal. Involved in this research are people likely familiar to Professor Burgess: UQAM historian José Igartua and four doctoral students in the UQAM History Department. Professor Burgess has tenure and the academic freedom to conduct research and publish on controversial topics, including, I suppose, controversy-free accounts of tobacco companies. But this needs to be done openly, in full view of the scholarly community. SSHRC and other granting agencies rely on peer reviewers to assess applicants, whose scholarly merit and professional standing can only be determined with full disclosure of relevant research activities and publications. The other issue here is whether consulting for a tobacco company should affect one's eligibility for government research grants? I think so. Tobacco use costs the Canadian economy $17 billion annually, including $4.5 billion spent on direct health-care costs. It kills nearly 40,000 Canadians each year. Scholars who take money from Big Tobacco to write accounts that omit such unpleasant truths should have no claim on publicly-funded research dollars. There's one final irony here. In the book's acknowledgements, Choko and Burgess first offer thanks to ITC vice-president for legal affairs Donald McCarty. For many years, McCarty had spearheaded ITC's legal efforts to have Ottawa ruled a co-defendant in class-action and provincial healthcare costs recovery lawsuits filed against the tobacco industry, legal maneuvers that proved both protracted and highly costly to federal taxpayers. Joanne Burgess is a Professor in the History Department at the Université du Québec à Montréal. Prof. Robinson’s article contains a number of assertions that require clarification and correction. I wish to set out some facts for the record. 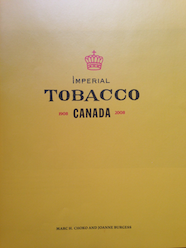 In 2007, Marc Choko was hired by Imperial Tobacco to produce a commemorative book for its current and retired employees on the occasion of the company’s 100th anniversary. Prof. Choko is an authority on the history of posters and graphic design in advertising and was a professor of design at my university, Université du Québec à Montréal, until his recent retirement. As he clearly states in the book’s acknowledgements, he initiated the project and worked to bring it to fruition. It was also in 2007 that Prof. Choko hired me to provide historical background on the company for this book. He approached me because of my expertise on the industrial history of Montreal and my previous work on Imperial Tobacco. The book is primarily a presentation of company advertising and graphic art during the 20th century. 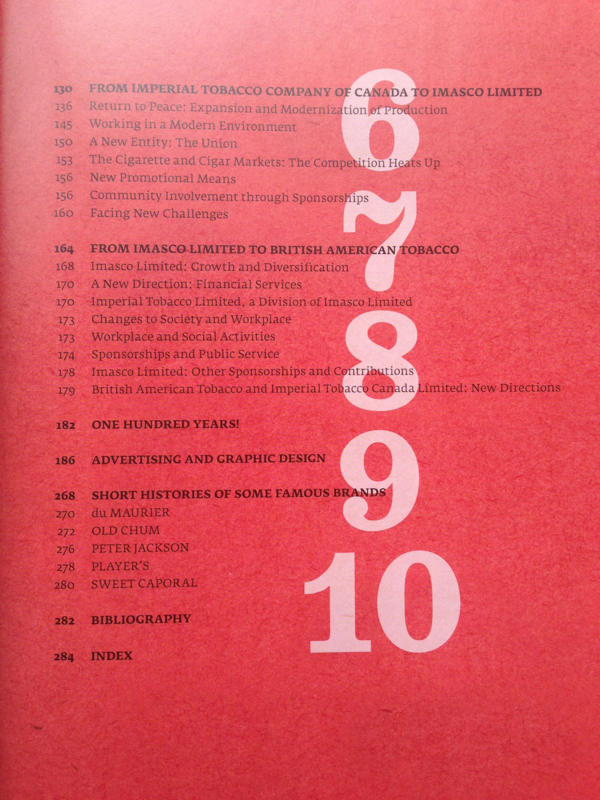 My contribution was intended to supplement this content through a discussion of the corporate history of Imperial Tobacco and its predecessor and associated companies, its evolving markets, and the history of its labour force and their working conditions. This overview represents an original and valuable addition to the history of an industry which played a significant role in Quebec’s economic development. The approximately 60 pages that I wrote on these matters, in French, were incorporated by Prof. Choko into the Imperial Tobacco book. The book in question was commissioned by the company to offer to its employees and was never distributed or sold to the public. Nevertheless, the work that I did for this publication has always been on my résumé. The material I wrote adheres to a high professional standard and I have always been pleased to acknowledge it. Prof. Robinson implies that my research for the 2008 book was done in secret and not disclosed to the Social Sciences and Humanities Research Council (SSHRC) or other granting agencies. This is untrue. In fact, my work on the book is mentioned on the UQAM website. This information is clearly publicly available, as is the case for my other activities in applied and public history and my academic publications. In 2010, I applied to SSHRC for a Partnership Research Grant on behalf of a team of 26 co-applicants and collaborators and a dozen partner institutions. As Prof. Robinson himself acknowledges, the grant process is very competitive and success represents important recognition by one’s peers. Our team, Montréal, plaque tournante des échanges: histoire, patrimoine, devenir, was delighted to be selected for a large multi-year grant. I am pleased to say that this partnership, which I currently lead, is now actively engaged in producing its work on Montreal’s history and heritage. Professor Burgess states that the book was intended only for employees and was “never distributed or sold to the public.” On-line book sellers have sold the book. The French-language version of the book is available at the Bibliothèque et Archives nationales du Québec (National Library and Archives of Quebec). My university library also has an English copy, a fact brought home to me when one of my students used this book for an essay on historical tobacco marketing. Prof. Burgess contends that she has always acknowledged openly her commissioned work for Imperial Tobacco, even saying that “my work on the book is mentioned on the UQAM website.” It is today listed on her faculty web page. But that was not the case in June 2013 when I was doing research on the relationship between Canadian historians and tobacco firms. There was then no mention of the Imperial Tobacco book on Prof. Burgess’s faculty page. (The page was saved on 19 June 2013, using Zotero; see full text below). At some point in the past year, some six years after the book’s publication, Prof. Burgess added this title to her faculty web page profile. Coincidentally or not, during this period news articles on the sub rosa work done by Canadian historians for tobacco companies began to appear. See here and here. In her application for the $2.3 million SSHRC grant in 2011, Prof. Burgess says that she included the Imperial Tobacco book on her accompanying c.v. We should take her at her word. But this still raises important questions, I believe, about what role prior funding by tobacco companies should play in eligibility for government research funding. I have applied for and held health-related research grants that screen for an applicant’s prior funding by tobacco interests. I’ve made my choice, in this sense. Of course, these are issues to take up with SSHRC and other federal granting agencies, not Prof. Burgess.